Whatsapp Group Chat : Everything you should know about it | Free Pc to Phone Calls, Free Voip Calls to India International ! Whatsapp is a multi platform text messenger application available for all the devices now. For me it has replaced my telecom sms (which is saving me big bucks) and I use it almost all the time. For blackberry users, it has replaced their BB messenger service and people prefer Whatsapp instead of Blackberry Messenger (probably the reason is that they can chat with non blackberry users as well). Be it Android, iPhone, Windows Mobile, Blackberry, Nokia or even PC, Whatsapp is used on all devices and almost by everyone using smartphone and has access to internet on mobile. What actually keep up busy is Group Chatting in Whatsapp Messenger. You can easily create a group of friends (Assign it a name) and send message to all of them in one go. People in the group can chat with each other and its visible to only the group members. Group Chat in Whatsapp is quite similar to what we have in our Gmail Chat client. You can create as many groups as you like and your friends can also add you to various groups. In the group chat, you can share jokes, send message, chat, send pictures or videos as well. In the post below, we will discuss everything related to Whatsapp Group Chat! Any member of group has the right to change the group photo and group name (status). To do so, open group chat. - Scroll down to see "Delete and Exit Group". Select this. This is another very interesting feature of Group Chat. At times what happens is that people on the group are very active and keep sending messages. This may get annoying for other people in the group. What you can do is mute it say for 8 hours. So for next 8 hours, though you will receive message but it will not make any sound. How it is different from turning whatsapp notifications off ? The difference is that when you put the group chat as mute, it won`t make any sound when you get a new message, but it will show the notification in your phone, or it may vibrate. If you place it as notifications off, then you won`t receive anything, no sound, no vibrate, no notification at all. If you are the owner of the group and delete it, another group member is randomly designated as the new owner of the group. Now the new owner can add you again as a group member. But what if you want to select a particular person to be owner of the group and not to be selected randomly. Probably this is not possible now and it is random! - Group owner (person who started this group) has the rights to remove a particular person from the group. In the group chat, go to group info, simply tap the person and select remove. This is also known as "Kick out a person from Group Chat". - Only the group owner can add members to the group chat. If you were previously the group owner, a new owner was assigned when you left the group. Please ask the group owner to add you back to the group. - Whatsapp Group Chat has a limit of 30 people. That is no more than 30 people can chat in a same group. - You can delete a specific message from Whatsapp Group Chat. For that, simply tap the message and select "delete message". Please note that the message will be deleted only from your message history and other people in the group can still see the message. - Anyone in the group has the power to change group icon and group name. - You can add Emoticons to Group Name as well. 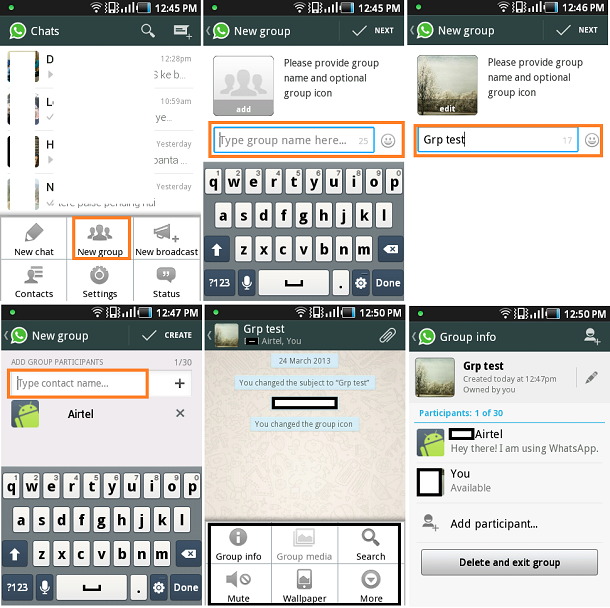 - You can change the wallpaper of Whatsapp Group Chat as well... Tap left button and select Wallpaper. Now you can choose wallpaper of your choice. Basically wallpaper will get changed for all the chats.